There’s some Save TV7 action on! The lovely folks running the campaign to Save TV7 have sent me an e-mail advising me of a bunch of things happening around the country. I’ll paraphrase, but the important part is this, for Aucklanders – go to the public meeting at Freemans Bay Community Centre TONITE Tuesday 15th May, from 7-9pm. Brian Edwards is moderating a discussion with Clare Curran, Julie Anne Genter, Andrew Williams, Joe Atkinson and the public. They’re still hoping a representative from the Government will join them as well to explain the policy of closing down New Zealand’s last Public Service TV channel. If you live in Wellington, Nelson, Christchurch, Palmerston North, Dunedin, or Hamilton, your turn is coming up, from 21st May in Welli thru to 13th June in Hamilton – see the Save TV7 site for more details. The on-line petition is still going, with over 22,000 signatures as of Monday night. Still time for more supporters to sign, so get cracking! The Save TV7 crew have been busy getting badges, t-shirts and stickers produced, so look out for those at the meetings, and show your support. And finally we’re asking our friends (that’s you) to send us photos of yourselves in striking poses for our future ad campaigns. We’d like shots that put you in context (however that might be) and also a little rant about why TVNZ 7 is important to you. We’ll be compiling lots of the photos into an ad to show the government that there are real people who’ll be affected by the closure of TVNZ 7. Send it to savetvnz7@gmail.com and note that by doing so you agree to have your photo put on the internet and in newspapers up and down the country. So remember to SMILE. 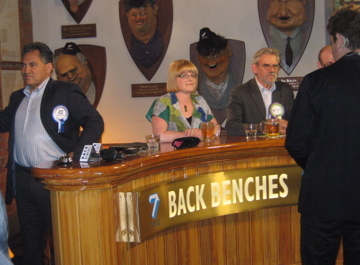 Finally, another plug for my favourite TV7 programme – Back Benches, filming again this week on Wednesday night at the Back Bencher pub in Molesworth St across from Parliament, be there from 8pm-ish to get a seat, or book yourselves a table from 6pm to have dinner before the show. This week it’s Green Party MP Holly Walker, Labour MP Grant Robertson, National MP Colin King, and New Zealand First MP Tracey Martin. Gutted I’m away and can’t be there to see this lot tackle the topics of bullying in schools and online, and the ramifications of new social welfare provisions aimed at beneficiary mothers and their children. 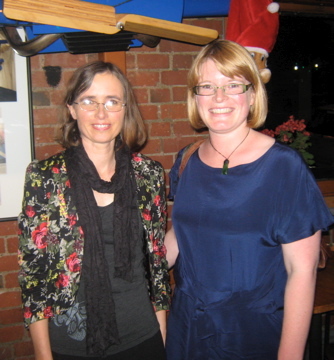 The Auckland Meeting went off pretty well – media coverage including video here, by Granny Herald. Back in the House, and Back Benches. Well, it was a marathon busy day yesterday. Seven maiden speeches in the House by new Green MP’s, our highest number of new MP’s since the Party first came into Parliament in 1999. There’s speech transcripts and Parlie TV footage on Frogblog. So I’m not going to repeat the review of the afternoon’s speeches, except to say that I was very moved by each and every one of them, some who have been colleagues on issues campaigning for over ten years. There are concurrent numbers of extra parliamentary Green office staff, too, so the mix’n’mingle afterwards was a good catch-up time & helped to work out who’s doing which jobs post-election. Then later, on to the Back Bencher pub for another round of Damian and Wallace ‘back on home soil’, as they put it themselves, which seems like an extraordinary admission from two Aucklanders. Eugenie Sage had her first experience on the panel, along with Alfred Ngaro (N), David Clarke (L, Dunedin North) and Richard Prosser (NZ 1st). There were some interesting moments as panelists wrestled with ways not to answer direct questions put by the presenters, and some bemusement when Prosser appeared to be quoting history when responding to questions about his party’s policies. Alfred Ngaro (obscured), Wallace, David Clarke, Eugenie Sage, Damian obscuring Richard Prosser completely. Holly Walker and a table of Green family & friends got quite a bit of notice during the evening, as well, especially during Damian’s wee pep talk to get incidental footage to use in the promo for this season of Back Benches. Being such great sports, none of the extremely relaxed Young Greens even considered the option of asking for appearance fees for performing in an advertisement. 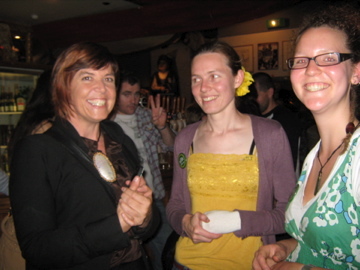 Voluble and Relaxed Young Greens surrounding MP Holly Walker. Myself, I was hiding down the back with some more mature friends, and chewing my way through most of a block of Whitaker’s Dark Almond; my only concession to Valentine’s Day being to buy myself what I like, and share it with those I happen to be with as the week progresses. Don’t even bother trying to spot us, we were well shielded by loquacious and inebriated folk in the table nearer the bar. The full episode is here on TV7’s chunk of the On-demand website. Do have a look for the petition to save TV7 as well, while I’ve got your attention. If nobody bothers, we lose them mid-year when this season finishes. This is a very brief overview of what was a very busy night. 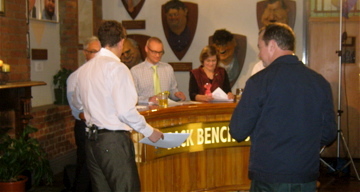 MP’s on the panel were David Parker (L), Chester Burrows(N) and Jan Logie, our new Green MP on her first Back Benches. In the audience were many more MP’s, so the guys had a quick chat with David Shearer, Grant Robertson, and Mojo Mathers (first deaf MP, interviewed well by Damian, who expounded on her MSc in Ecology and Environment, which is going to be equally important to her as her Disability issues portfolio). The show is here at TVNZ7. The petition to save TVNZ7 is still here. Go on, it’s still worth sending them a message! Buy a t-shirt, even!!! I edited this today to add the links, but I can’t be arsed describing all the wierd and wonderful things that happened during the show, so just click through and watch it, already. Chester Borrows gets an honourable mention for behaving like a complete arse. No prizes for identifying how many people I know got a chance to state an opinion during the vox pops, but I was assiduously avoiding Damian by hiding near the kitchen for most of the show. 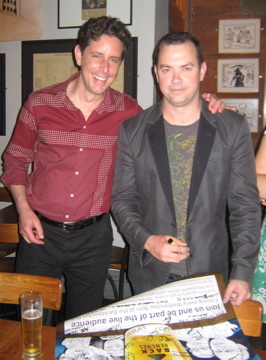 Wallace and Damian, didn't they do well? 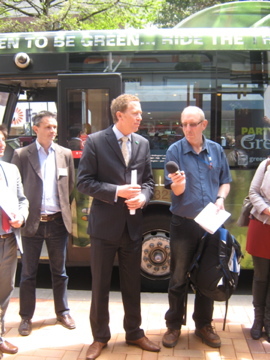 Transport policy launch – Get on the bus for light rail! 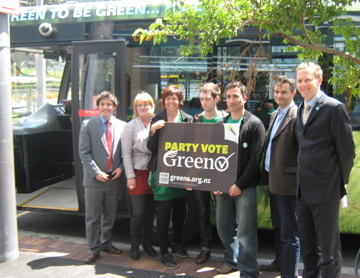 Today’s Wellington launch of the ‘Green is for go’ transport policy saw a bus full of Green Party volunteers, candidates and MP’s touring the route of the proposed light rail link from Wellington Bus Station, stopping outside Kirkcaldie & Stains department store, then through to Courtney Place and on to Wellington Hospital in Newtown. 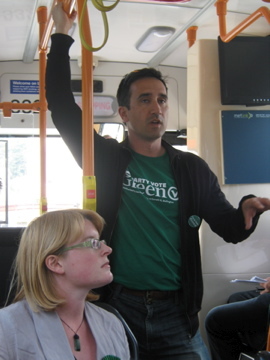 At each stop, there was an opportunity for media to catch interviews with the candidates and MP’s, and for volunteers to hand out leaflets detailing the new transport policy to passersby. You can read the gist of the transport plan here, and read MP Gareth Hughes’ press release here. 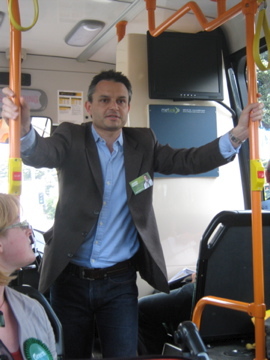 While the bus was in transit, the passengers heard from MP Gareth Hughes (Ohariu) and candidates Holly Walker (Hutt South), Zach Dorner (YG ‘Victoria University candidate’), Jan Logie (Mana), Tāne Woodley (Rimutaka), and our own James Shaw (Wellington Central). Each spoke about the public transport challenges faced by their respective electorates, and the value of added funding for buses, trains and light rail. Jan Logie spoke of the enormous community opposition to the Kapiti Expressway, which has galvanised local residents, and James Shaw took his stand just as the bus rounded basin reserve, describing the extent to which the proposed flyover would overshadow the historic Basin cricket grounds, as well as cutting off Newtown, Berhampore and Island Bay access into the Te Aro/CBD area. Thanks TV7 for being such organised little bunnies, here’s that episode I was talking about in a post earlier this week. Star of the show must be Holly Walker, who has acquitted herself very well for her first outing as a nearly-politician, on a panel decimated by winter illnesses, with Chester Burrows holding the Nat’s seat and Clair Curran speaking for Labour. Click here for the show at TVNZ on-demand. There’s also a bit of footage of the Cannabus crew and Billy McKee, down for an evening out before Billy’s court appearance today in Levin District Court. 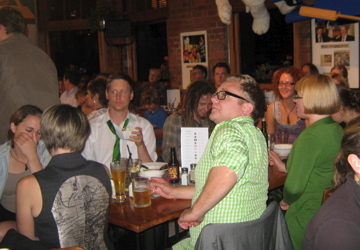 And some very good vox pop’s from the table of young-ish Greens who were there to support Holly, insider alert, play spot-the-Bowen-crew bingo. And footage on TV3 here from today’s protest at Levin District Court.